You may recognize the above quoted dialogue from my white paper on medical tourism and workers’ comp. 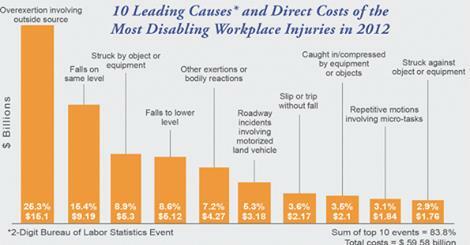 I am reprinting it here because I came across a report from the Liberty Mutual Research Institute for Safety that highlighted the top ten causes and direct costs of the most disabling workplace injuries in 2012. My thanks goes to Jim Mecham, Continuing Education Director and Return-to-Work Software Developer at OCCUPRO, for bringing this to my attention through his post on LinkedIn. The report, the 2014 Liberty Mutual Workplace Safety Index is based on information from Liberty Mutual, the US Bureau of Labor Statistics (BLS), and the National Academy of Social Insurance. The Index provides statistics for injuries that occurred in 2012, which is the most recent year for which data was available. The Index showed that the most disabling injuries and illnesses had a direct workers’ comp cost of $59.58 billion, which translates to over a billion dollars a week spent by business on the most disabling injuries. The following chart indicates what those ten injuries are, the percentage of each type of injury, and the direct cost. Overexertion accounted for 25.3% of injuries, and is further identified as being caused by lifting, pushing, pulling, holding, carrying, or throwing, and cost businesses $15.1 billion in direct costs. Falls to same level accounted for 15.4% of injuries, costing $9.19 billion. Struck by object or equipment injuries accounted for 8.9% of injuries and cost $5.3 billion. Falls to lower level accounted for 8.6% and cost $5.12 billion. Other exertions and bodily reactions accounted for 7.2% of injuries and cost $4.27 billion. This includes injuries resulting from bending, crawling, reaching, twisting, climbing, stepping, kneeling, sitting, standing, or walking. These ten injuries comprised 83.8% of the total cost burden for disabling work-related injuries in 2012. For the employer, it means a lot, especially in terms of dollars and cents that can be avoided if there are proper safety programs in place to lessen the frequency and severity of these injuries. However, accidents do occur, and while safety programs do work, they don’t always live up to the promise; nor do workers ever follow safety rules, so when these injuries occur, it would be wise for an employer to find a less expensive way to deal with the injury than expensive surgeries at home. For the workers’ comp industry, it means that you are not doing a very good job of saving your client’s money, or you are doing a great job making money for yourselves and other workers’ comp service providers. And finally, for the medical tourism industry, it means you have some work to do to go out and get this business and prove to the American employers, insurance companies and injured workers that when any of these types of injuries occur, you can provide them with the best care and the lowest cost. As I said in my presentation in Reynosa, Mexico last November, “[the] Medical Tourism industry must take [the] lead and go after the market; the market will not come to you”. I am willing to work with any broker, carrier, or employer willing to save money, and to provide the best care for their injured workers or their client’s employees. Call me for more information, next steps, or connection strategies. Ask me any questions you may have on how to save money on expensive surgeries under workers’ comp. Connect with and follow me on LinkedIn and my blog. Share this article, or leave a comment below. This entry was posted in Direct costs, Employees, Employers, Injury Management, Medical Tourism, Medical Travel, Workers' Comp, Workers' Compensation and tagged Costs, Employees, Employers, Medical Tourism, Medical Travel, Workers, Workers' Comp, Workers' Compensation on March 15, 2015 by Transforming Workers' Comp.